Franciscan monk; born at Capistrano, Italy, 1386; died 1456. Owing to his remarkable power as a popular preacher, he was sent by Pope Nicholas V. (1447-55) as a legate to Germany, Bohemia, Moravia, and Silesia, with the special mission to preach against the Hussites and other heretical teachings and to subdue "the disbelieving Jews," in accordance with the resolutions adopted at the council of Basel (1431-43). His stirring sermons, in which he urged the people to repent of their sins and to fight against the Freethinkers, made a thrilling impression. Knowing how easy it is to excite the masses by appealing to their prejudices, Capistrano, in his discourses, accused the Jews of killing Christian children and of desecrating the host. The Jews trembled at his approach, for his sermons seemed like invitations to riot. His admirers called him "the scourge of the Judeans." The Bavarian dukes, Louis and Albert, influenced by Capistrano's agitations, drove out the Jews from their duchies; in some places in Bavaria Jews were forced to wear the degrading Badge on their coats (1452). Bishop Godfrey of Würzburg, reigning duke of Franconia, who had granted the fullest privileges to the Jews of his duchy, under the influence of Capistrano issued an ordinance (1453) decreeing their banishment. The towns and landowners were enjoined to expel the Jews, and Jewish creditors were deprived of a portion of the debts owing to them. In Silesia the Franciscan was most zealous in his work. When Capistrano arrived at Breslau, a report was circulated that one Meyer, a wealthy Jew, had bought a host from a peasant and desecrated it. Thereupon the local authorities arrested the representatives of the Breslau Jewish community and confiscated their houses and property for the benefit of the city. 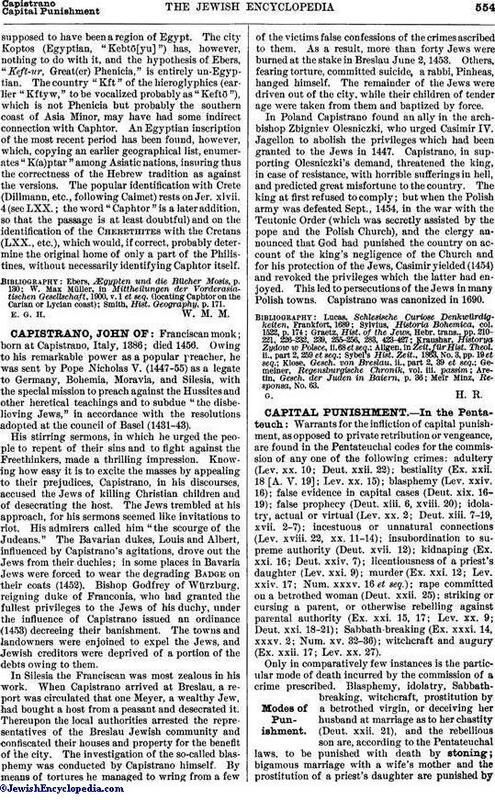 The investigation of the so-called blasphemy was conducted by Capistrano himself. By means of tortures he managed to wring from a few of the victims false confessions of the crimes ascribed to them. As a result, more than forty Jews were burned at the stake in Breslau June 2, 1453. Others, fearing torture, committed suicide, a rabbi, Pinheas, hanged himself. The remainder of the Jews were driven out of the city, while their children of tender age were taken from them and baptized by force. In Poland Capistrano found an ally in the archbishop Zbigniev Olesniczki, who urged Casimir IV. Jagellon to abolish the privileges which had been granted to the Jews in 1447. Capistrano, in supporting Olesniczki's demand, threatened the king, in case of resistance, with horrible sufferings in hell, and predicted great misfortune to the country. The king at first refused to comply; but when the Polish army was defeated Sept., 1454, in the war with the Teutonic Order (which was secretly assisted by the pope and the Polish Church), and the clergy announced that God had punished the country on account of the king's negligence of the Church and for his protection of the Jews, Casimir yielded (1454) and revoked the privileges which the latter had enjoyed. This led to persecutions of the Jews in many Polish towns. Capistrano was canonized in 1690. Meïr Minz, Responsa, No. 63.